The new Renault Twingo Hatchback is a dinky city car that bobs about the town without a care in the world. It’s got a tiny turning circle for those otherwise tricky-to-negotiate cramped spaces, and a surprising amount of interior space. Moreover, its rear-wheel-drive layout and rear-engine enhance its individuality in a market full of like-for-likes. Yet as well as helping the car distinguish itself from its rivals, such a layout is precisely why it has so much space. 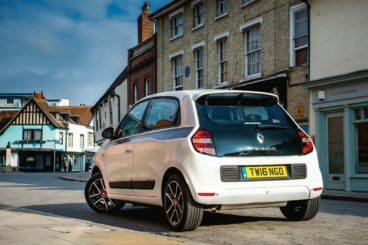 OSV takes a closer look at what it’s all about with our 2017 Renault Twingo Hatchback review. It can’t offer as much entertainment as some rivals, but there is no doubt that the Twingo is a piece of cake to drive in the town. We don’t recommend that you attack bends with lots of enthusiasm, but it’s a perfectly competent companion. One of the reasons it doesn’t handle as sharply as some competitors are its aforementioned rear-wheel-drive layout. Coupling that with a slight build means Renault have put together a car that doesn’t have enough weight over its front wheels to take bends as crisply as front-wheel-drive city cars. Worse still, its steering offers very little feedback. If you opt for a turbocharged model, you get a variable power-steering system with your Twingo. It makes the car feel more natural. Meanwhile, the soft suspension setup ensures a comfy ride on standard models. The GT model gets a stiffer suspension, which helps to control body lean in bends more. And while this model is more precise than entry level variants, it’s still way off the likes of a Ford Fiesta. On the motorway, the Renault Twingo Hatchback struggles a bit, but its tight turning circle comes in handy in the town – especially when it’s time to park. In terms of the engines, there are no diesels available, which means you have to take your pick from a trio of petrols. A 1.0-litre unit that develops 69bhp sits at the bottom of the range, and can do 0-62 in a modest 14.5 seconds, before maxing out at 94mph. This is by far and away the slowest engine in the range. A turbocharged 0.9-litre petrol engine is next in line, developing 89bhp and motoring from rest to 62mph in a much better 10.8 seconds. Topping things off is the GT model, with its 109bhp power plant able to spring you from a standstill to 62mph in 9.6 seconds. All models come with a standard manual transmission, but you can add an EDC automatic ‘box for £900 if you choose the 0.9-litre engine. This is a modern-looking car inside and out, but it can get loud. It’s bigger than last time, boast better build-quality, and comes with a solidly put together dashboard that’s also simply designed for ease of use. The nosiest engine is the turbocharged 0.9-litre unit, but it quietens down when you cruise. However, wind noise is an issue and insulation is not great. On the plus side, the soft suspension combines with comfy seats to make all your journeys a bit more pleasant. 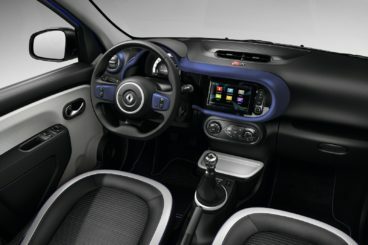 The Twingo can be customised too, which means you can pick and choose the interior trim that suits your mood the best. Is it practical? Surprisingly, yes. Visibility is helped by the relatively high driving position, which makes it even easier to park and negotiate tight turns (the tight turning circle already helps to this end). On the other hand, your passengers in the back have a bit of a restricted view, thanks to front-seat headrests. Thanks to the car’s layout, Renault has been able to get more out of the Twingo’s dimensions than most rivals. We wouldn’t say it’s awash with space, but there’s no real reason for anyone to be complaining. There are lots of storage spaces here and there too, though rear door pockets are frustratingly missing from all but the range-topping model. The entry-level model also misses out on a height-adjustable driver’s seat. The boot measures just 188-litres. Its advantage over rivals, though, is that it’s more usable. There is no lip, and you can also boost luggage capacity to 219-litres by fixing the back seats into an upright position. Fold them down altogether, and you can increase boot room to 980-litres. Standard kit is decent, but what will grab buyers’ eyes the most are the different interior trims you can choose from. The Touch has a few available, and you can colour your air-vent, centre console and steering wheel inserts in either blue, red or black. The Dynamique model adds a leather steering wheel, as well as alloys and more choice of engines. The Dynamic S trim adds leather upholstery, while the GT model comes with bigger 17” alloys, more colour choices, twin exhaust pipes and rear parking sensors. In terms of how safe the car is, it was awarded 4/5 by Euro NCAP for its crash test performance, while standard safety kit includes four airbag’s, a tyre-pressure monitoring system, emergency braking assistance and electronic stability control. Prices for the new car start out from £9,995 and rise to £15,515. If you prefer to lease, you can pick up a deal from £153 + VAT per month. For more information on our leasing deals, check out our page here. In terms of its running costs, the economy is better than last time thanks to the introduction of smaller engines. Moreover, the Dynamique SCe 70 model benefits from stop-start tech, and can return as much as 67.3mpg and emits less than 100g/km of CO2. The Play SCe 70 and Expression SCe70 models actually have the same engine as the Dynamique SCe 70 but make do without stop-start tech. As a result, they return 56.5mpg at best, and emit more than 110g/km of CO2. The Dynamique TCe 90 model tops the range, and returns 65.7mpg, and emits under 100g/km of CO2. It’s right at home in the city, where it makes mincemeat of difficult tight turns. It’s as cute as city cars are meant to be. But striking black and red stripes give it a sporty flavour, too. Its rear-engine layout has helped Renault get more space out of its compact dimensions than was surely possible. Wind noise is an issue, especially at higher speeds. There are cheaper, more economical rivals available. 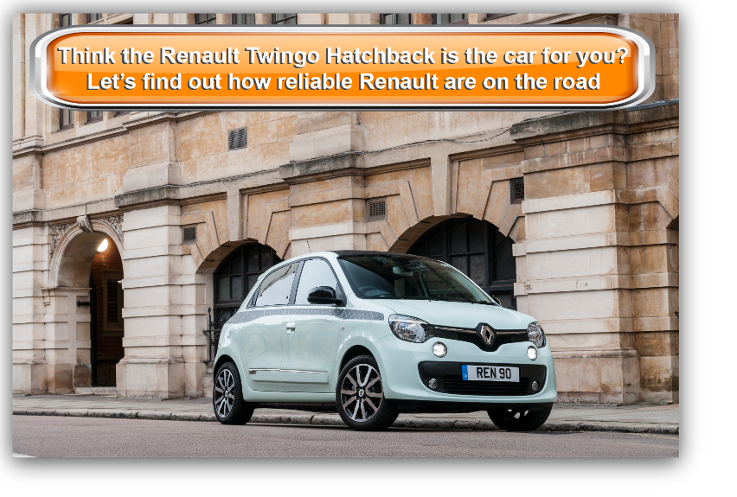 Let’s see how the car measures up against its rivals in the comparison section of our 2017 Renault Twingo Hatchback review. 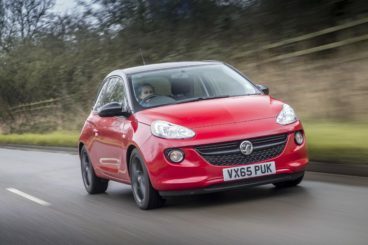 The new Vauxhall Adam Hatchback is a smart, stylish city car that’s affordable, customisable, and easy to drive. Easy to drive – but not much fun. The steering is achingly dull, and the overly firm ride aren’t good attributes. Moreover, there isn’t much driver involvement to be had. That said, the faster Adam S model gets brake parts and suspension from the hot hatch Vauxhall Corsa VXR, and it can boast sharper handling. All models struggle to cope with poorer surfaces, though, especially if you opt for the bigger alloys. In the town, the Adam Hatchback feels at home, where it’s happy to nip through traffic. With no diesels to choose from, your choice is limited to a handful of petrols. A lethargic 1.2-litre petrol engine kicks things off. It takes almost 15.0 seconds to complete the 0-62 dash and makes a terrific din while doing so. The 1.4-litre petrol offers a similarly noisy 86bhp variant. It’s quicker, cutting the 0-62 dash down by almost 2.5 seconds, but we’d skip this one and test drive the 99bhp variant instead. It does 0-62 in 11.5 seconds, and generally feels more full of beans. A turbocharged 1.0-litre 113bhp petrol is faster still, and can get from rest to 62mph in less than 10 seconds. However, speed fans will surely overlook this in favour of the Vauxhall Adam S model that motors from a standstill to 62mph in 8.5 seconds. That’s quick, but there is a price to pay at the pumps, as it returns 47.9mpg economy at best. At the other end of the spectrum, the most frugal engine is the 1.2-litre petrol, which averages 57.6mpg at best. Inside, the Vauxhall Adam Hatchback is presentable and even classy in places. You can pretty much customise it to your heart’s content, and the dashboard is stylish and well laid-out. It comes with colourful inserts, chrome rings for the air vents, while the sporty leather steering wheel is another highlight. Ride quality is poor and affects comfort, but the materials used and the overall fit and finish are good. It doesn’t fare too badly on the practicality front either. It won’t be the comfiest place to spend your time on longer journeys, but for short trips it’s a faithful companion. However, there are issues. There is no five-door variant, while a sloping roofline diminishes rear headroom. Back seat legroom is not fantastic either, and visibility is problematic. The boot, meanwhile, measures a paltry 170-litres and comes to a high lip. 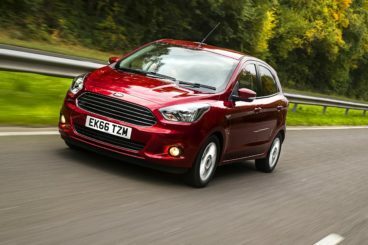 Despite its name, the new Ford Ka + Hatchback actually has more in common with the Fiesta than the now extinct Ka. It shares its mechanical bits with the Fiesta, is only a tiny bit shorter and is just as much fun to drive. What sets it apart from the Fiesta? It’s cheaper. The problem is that cheaper always means there is something missing. In the Ford Ka +’s case, that something is a strong engine. While the driving experience here is involving and rewarding, the sole 1.2-litre petrol engine just isn’t up to today’s standards. And that’s a real shame. In its smallest, cheapest guise, it develops less than 60bhp, and takes a sluggish 16.0 seconds to do 62mph (just wait for your kids to ask if we’re there yet). For an extra grand, you get a Zetec powered by the same 1.2-litre petrol engine, but which produces 84bhp. That’s’ a lot better, and it means you can sprint from rest to 62mph in a more respectable 13.6 seconds. That said, neither engine impresses. Both are limited, and both need to be pushed super hard. Other than that, though, the Ford Ka + Hatchback offers a genuinely engaging driving experience. Running costs are good too, with both variants of the 1.2-litre petrol engine returning 56.5mpg while emitting 114g/km of CO2. There is no road tax to pay for the first year, and only £30 per year to pay after that. Inside, the car is charming. It’s comfortable and quiet, and lots of glass contribute to a breezy atmosphere. The dashboard is newer than the one in the Fiesta, and it’s also larger. The dials are crisp and clear, the fit and finish are good, and the quality of the materials is decent. We’d go as far as saying that this is Ford’s smartest cabin design yet for mainstream vehicles. It’s a surprisingly practical car, too. Thanks to the large windows, the Ka + Hatchback has the illusion of space, but there is a genuinely good amount of room on offer. The tall stance means headroom is good, while Ford claims there are twenty-one different storage areas. The boot, meanwhile, measures 270-litres, which makes it almost 100-litres bigger than the Renault. Fold the rear seats and you can increase it to 849-litres. Cute, sporty or quirky? The Twingo is possibly all three. Whatever it is, it’s a solid city car that gets you from A to B without any drama. Its unusual rear-engined layout means there is more space than usual for a car of this type, while funky looks give it lots of character. The new Renault Twingo Hatchback might just make the morning commute to work something to look forward to after all.